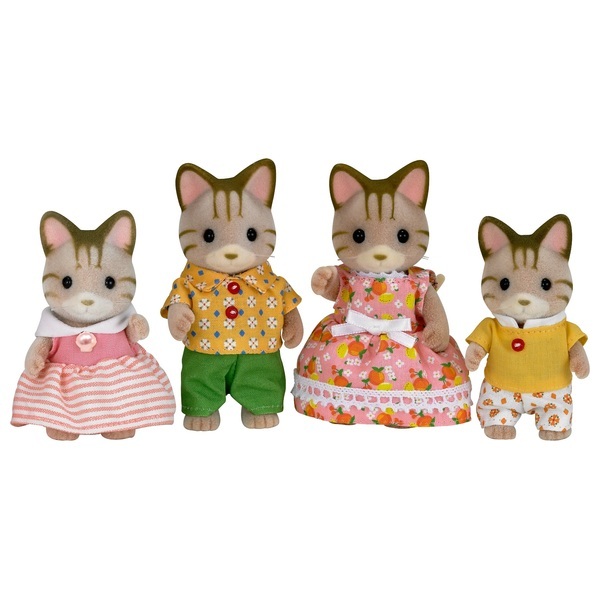 The Sylvanian Striped Cat Family is a 4 piece set that includes Father, Mother, Brother and Sister. Father Simon; is sporty, and especially enjoys marine sports. Whenever he has time, he takes his family to spend time at their Summer house by the seaside. In Summer, he teaches marine sports to groups of children from Sylvanian Village at the Sea Breeze Cape. Mother Amelia; likes fruits, even her favourite clothes have fruit patterns! She occasionally goes fruit picking and makes delicious meals and desserts with her freshly picked fruits. Her homemade fruit ice cream is her children's favourite. Amelia runs the ice cream parlour at the Sea Breeze Cape. Her creamy, sweet ice cream and refreshing sorbets made of fresh fruit from the Sea Breeze Cape are superb. Brother Shane; is very brave and wants to be an explorer when he grows up. He likes to play exploring on Adventure Island with his friends. He sometimes worries his parents by climbing up tall trees and going into dark caves. Sster Sabrina; is an active girl who loves to ride her bicycle while enjoying the beautiful scenery of the Sea Breeze Cape. When she stays at the Sea Breeze Cape, she exchanges letters with her good friend Freya the Chocolate Rabbit girl. She and Freya have pretty pink shell brooches that match. Sabrina's friendship brooch is very special to her.